On the first of Tibetan NEW YEAR, The monks perform extensive puja offering with special elaborate tsok (Guru Puja) offering to Tibet’s guardian deity Palden Lhamo from early dawn 2. AM to 8 AM. 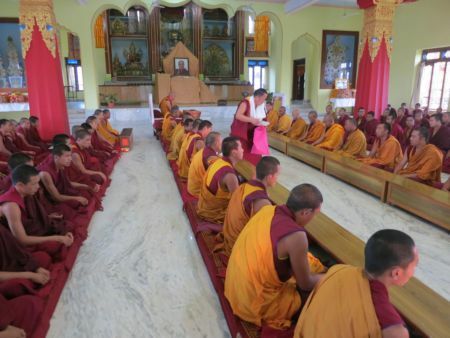 From 4-6th of the sixth month special consecration ritual, rabne-gelek-char-beb, is performed with tri-dimensional mandala of Yamentaka for sake of empowering world environment of security. From 16-22 of the ninth month Vajra-Akshobhya self-initiation ritual is performed for a week on the basis of sand mandala. From 19-25th of the tenth month Yamentaka self- initiation ritual is performed for a week on the basis of sand mandala with extensive offerings to commemorate Gaden-Ngachoe. From 27-29 of the twelfth month an extensive thanks-giving-rituals are offered to all the dharmapalas, guardian deities for two consecutive days. On the third and last day a day-long ritual mask dance, cham, is performed with Torgyak ceremony at the end. Tara ritual is performed on 8th day of every month. 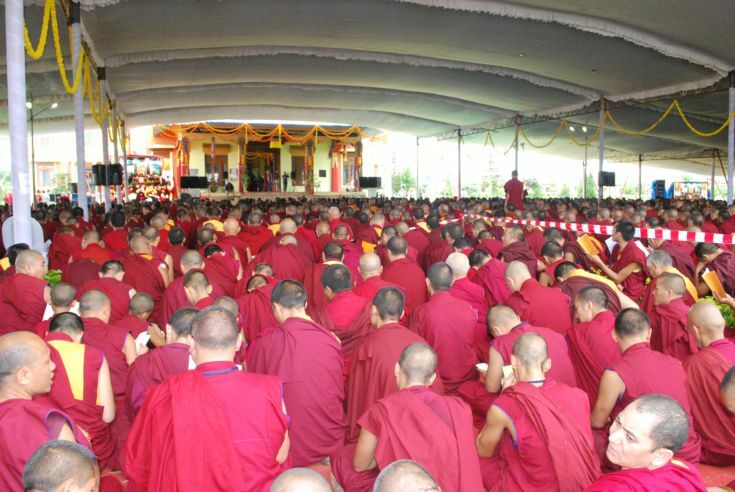 Tsok (Gana) offering rituals of common Guru-puja and Guru-puja combined with Heruka are performed on the 10th and 25th day of every month. A day long rituals of Dharmapalas, guardian deities are performed on the 29th day of every month. Medicine Buddha, Men-Lha, ritual performed on the last day of every month. Posatha, ordained community vow purification and restoration rite, is observed on the full moon and no moon day of every month.